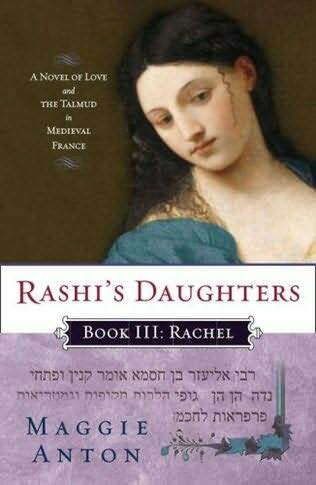 Rashi's Daughters, Book I: Joheved: A Novel of Love and the Talmud in Medieval France by Maggie Anton. These trends are underscored by two recent sets of work, the carefully researched and wonderfully imaginative historical fiction of Rashi's Daughters (Book I: Yocheved; Book II: Miriam; Book III: Rachel; by Maggie Anton and the poignant non-fiction lament and solidarity of Torah Queeries: Weekly Commentaries on the Hebrew Bible, Edited by Gregg Drinkwater, Joshua Lesser, and David Shneer with a Foreword by Judith Plaskow. 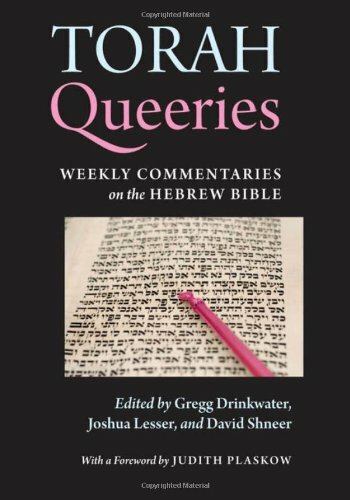 I review them together because Rashi's Daughters beautifully contextualizes the historic struggles for inclusion so well documented in Torah Queeries. “Visiting other women.” Rachel sighed. A major disparity, one that irritated her the longer they stayed, was that Tunisian women seldom left their homes except to visit other women. They rarely saw men outside their families. Experiencing medieval life through women's eyes includes aspects few may have pondered in our time, such as what it might have felt like to be targeted by a non-Jewish noble under the rules of “courtly love.” This is “where a knight devotes himself to a married noblewoman who feigns indifference to preserve her reputation...The code requires that, should the lady accept him as her lover, he must remain discreet and faithful despite all obstacles....And Frankish Jews have the status of knights.” As one of Rashi's married daughters is assailed by such a one, we learn intricacies of Talmud and the nobility of leniency in interpretation that our tradition attributes to truly great teachers. Isaac, she shows us, can be read as being the one who hungers for meat from the hunt and expects his first born to be a leader of men. Isaac the father projects onto Esau the type of man he wants to see. But Lev documents how Esau is not Mr. Macho in the text, how Esau tires of the hunt and eagerly sells his birthright for a pot of lentil stew. Leadership schemes and family politics are not Esau's mettle, but rather that of his smooth skinned brother. Lev reads Isaac as a parent blind to the true nature of his sons. She shows us an emotional Esau, a son who is more like a disempowered woman. In fact, his words echo those of Hagar-the-outsider who “lifted up her voice and cried” (Gen. 21:16) as does Esau (Gen. 27:38). Rose gives a number of reasons why Jewish men might put themselves into the female position vis-a-vis a masculine Godsense by talking about an “'old gay' designation of soft butch.... a woman who sometimes likes to look butch (masculine) but does not always want to behave that way... might want to experience behaving more passively...than aggressively....” So by analogy, she suggests this balance of masculine and feminine is also desired by “a whole lot of other people apparently, particularly in their relationship with God.” Which leads one to wonder, if this subliminal gender balancing that is so difficult to face might be the self-homophobic force behind opposition to women in tallitot? While Dr. Rose doesn't specifically make this leap, her feminist approach leads one to wonder if this could undergird the violent responses to the Women of the Wall. Religious violence and derision of gay males is often rooted in biblical interpretation. AIDS, for example, is viewed by some religious fundamentalists as a punishment by God, an explanation derived by analogy from the longstanding belief that God inflicted leprosy for wrongdoing. It is most unfortunate that Jay Michaelson's commentary in Torah Queeries lends a hand in perpetuating the mistranslation of the biblical term tza'ra-at as leprosy. A summary of research on tza'ra-at was reported in Koroth (Vol. 9 No. 11-12, 1991, published by the Department of History of Medicine, Hebrew University) and also in a 1993 letter to the New York Times. The report stated that tza-ra’at was erroneously rendered as “leprosy” when the bible was translated from Greek into English. Lepros actually means a skin reaction in Greek, whereas elephantiasis was the Greek term in its time for leprosy. Even more striking is that Hanson’s Disease, a.k.a. leprosy, bears no common manifestations with those listed in the Torah and, in fact, anthropologists and epidemiologists maintain that leprosy did not appear until the time of the Greeks. The Reform Movement's Hebrew Union College/Jewish Institute of Religion ordained Elliot Kukla, the first rabbi admitted as a woman and ordained as a man, in 2006. He wrote in his commentary on parshat Shemot probably the most memorable lines in Torah Queeries. As a youth on a family retreat with the Buddhist scholar Rimpoche, Kukla was caught repeatedly ringing a gong during silent meditation. He recalls Rimpoche first telling him that nothing is inherently wrong with ringing a gong, but there was a lesson to learn. Kukla learned from Rimpoche that “The key in growing...would be to figure out the right moments to ring the gong and when I needed to respect the silence.” This commentary, like many in the volume, helps us understand what sexual repression and societal oppression of those who are different sounds like and feels like. He urges us to, like the title of his commentary, be “Making Noise for Social Change” on gender matters. In some ways the volume feels like a visit to a gay bar. In Torah Queeries it becomes clear that one is a guest witnessing a different culture with its own vocabulary and behaviors. The GBLTQ authors and those they represent are a distinct “we” and not an “us” that includes the heterosexual reader. The volume reads as a gathering of essays by and primarily for those who have been gender oppressed. Although in her commentary on Balak, Dr. Lori Lefkowitz tries to say that we are all of us queer “because each of us improvises a Self, the Self is queer, by definition, it doesn't resonate as true in the face of the acute suffering of those oppressed for their non-heterosexual orientation." Torah Queeries makes a great gift for GBLTQ friends, colleagues and family members, Jewish and non-Jewish, because it provides fascinating “bent” perspectives on the parshiot and urges GBLTQ persons to speak up for the justice and respect they deserve. As a long-time ally to this cause, my primary disappointment with the endeavor is that it does not speak to all of us by presenting alternate gender interpretations in a way that would make it a must have Torah commentary for those of us who regularly study Torah and give talks about Torah. Since most all of us have GBLTQ family members, whether we know it or not, as an act of solidarity and support there is a place for this volume in every home library.